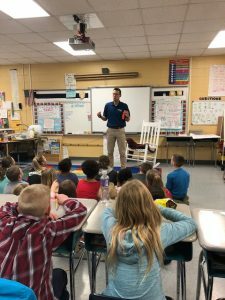 Home / MES Slideshow / A Visit From Chief Meteorologist Jason Boyer! A Visit From Chief Meteorologist Jason Boyer! What do you get when you combine 5th grade scientists and an esteemed meteorologist? You get an awesome day at Meadowbrook! Our 5th graders had a wonderful time today learning about weather from Jason Boyer! We are so grateful and we hope he comes back to see us again!